The Policy Pâtisserie | Combining food policy with baked treats. Combining food policy with baked treats. Preheat oven to 350°F. Prepare cupcake pans with cupcake liners. Sift first four ingredients together into a medium bowl. 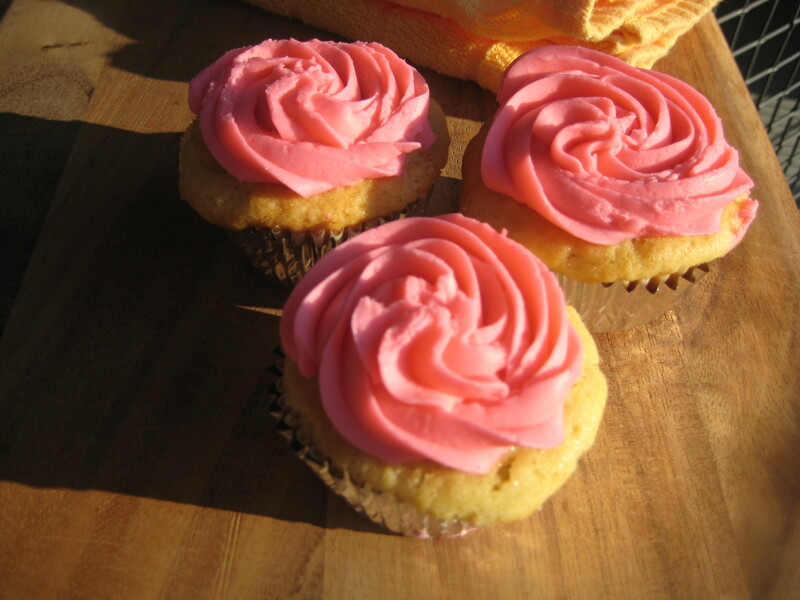 Beat butter and sugar with stand mixer until light an fluffy, approximately five minutes. Add in vanilla and the eggs one at a time. Reduce speed and beat in buttermilk. 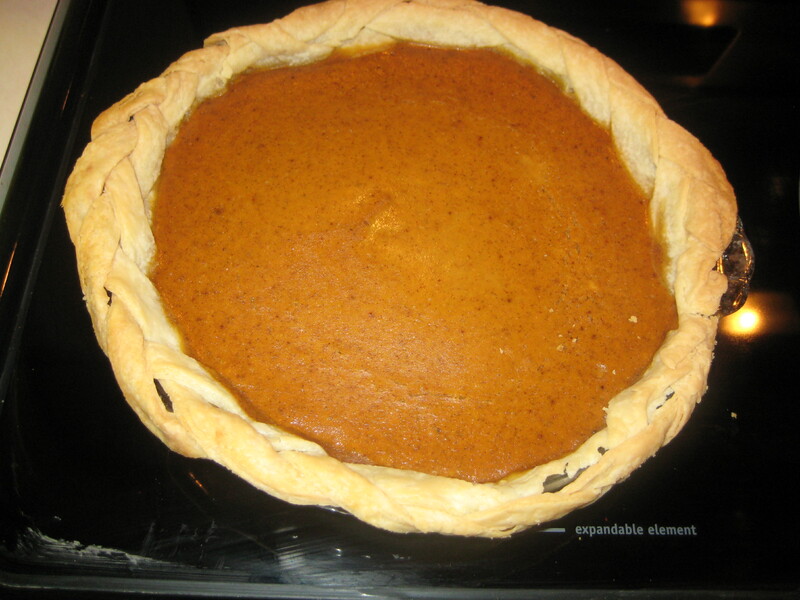 Libby’s pumpkin pie recipe is the by far the most ubiquitous. Truly, it’s a great recipe. This recipe is just modified to include more spices. 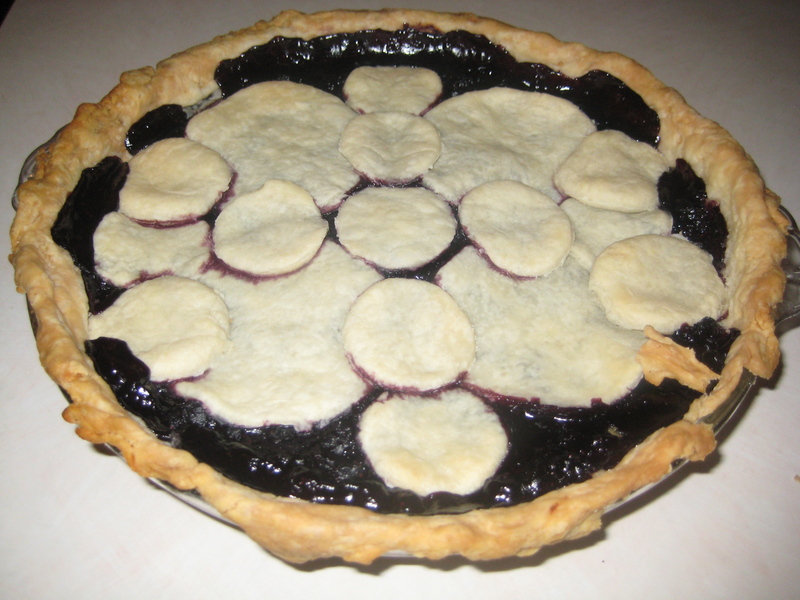 I also refrigerate the pie before baking which seems to eliminate any problem with the pie cracking. As a Michigan fan, I think I’m okay with this aspect of global warming. Add remaining streusel ingredients and stir until the mixture resembles coarse meal. Preheat oven to 350 degrees. Prepare 9inch springform pan with butter or cooking spray. In a small bowl, combine yogurt and vanilla. In a large bowl, beat butter and sugar together for about 3 minutes. Add the flour mixture in three batches alternating with the yogurt mixture. Add raspberries to mixture gently. Pour batter into prepared pan. 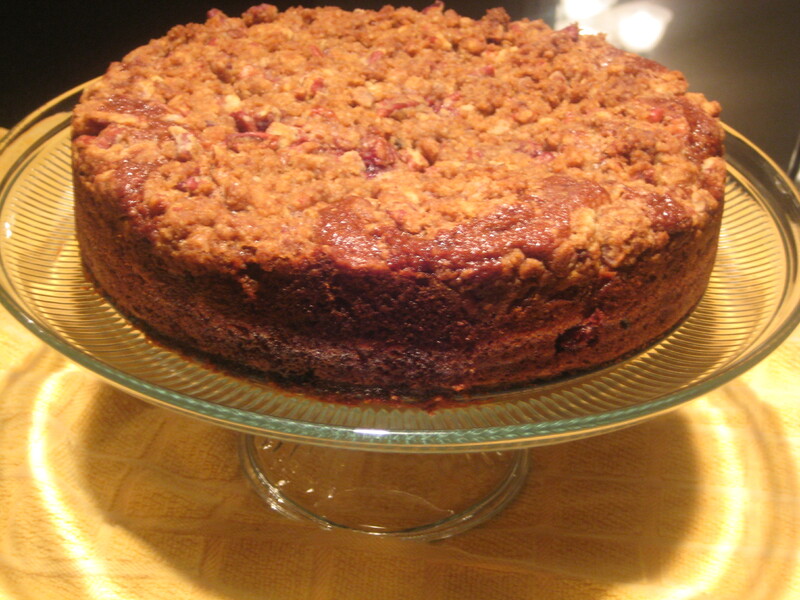 Spread streusel on top. 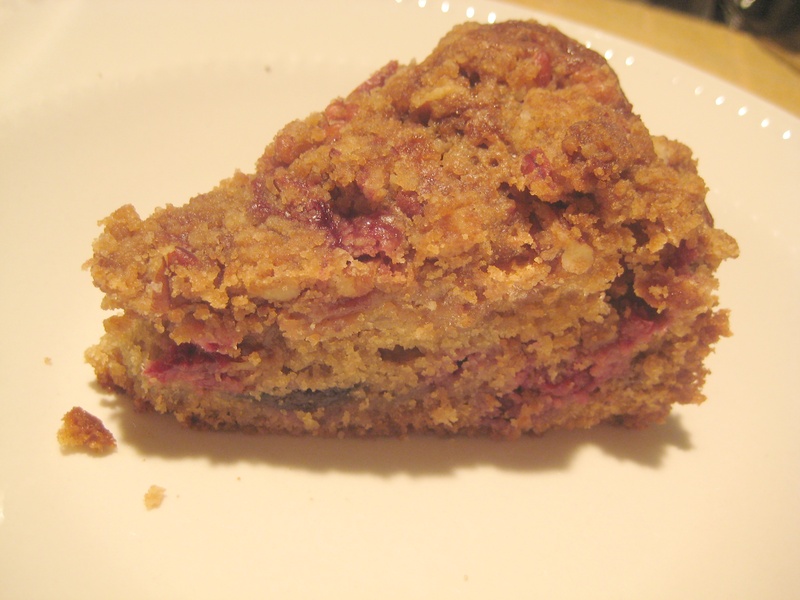 Bake for 30-35 minutes or until toothpick inserted into the center of the coffee cake comes out clean. Yesterday, some House Republicans decided that, for the sake of school lunches, pizza ought to be considered a vegetable. More precisely, what is being declared a vegetable is the pizza sauce that’s used on top of a lump of carbohydrates and under a mass of grease-laden cheese full of saturated fats. Based on the 2009 recommendations of the Institute of Medicine, Secretary of Agriculture Tom Vilsack recently released new guidelines for public school lunches. These guidelines initially faced resistance from potato industry lobbyists because of the limits his guidelines placed on the amount of potatoes that children could eat at school – specifically limiting the amount of potatoes served to one cup per student per week. Emerging from the lobbying efforts against these guidelines were plenty of misleading arguments about the nutritional value of potatoes and how they could be considered a “gateway vegetable” to other more nutritious vegetables like broccoli, carrots, or kale. In fact, The National Potato Council was so influential during these lobbying efforts that it prompted members of Congress to publicly question the research which suggests that dark green vegetables are healthier than potatoes. The motives of the USDA were even brought into question, and the debate was at times restructured to that of a “federal vs. local” argument as to who should issue nutritional guidelines for public school – the entirety of which was bunk. Vilsack released these guidelines not as a slight to the National Potato Council, but as a measure to stop schoolchildren from being fed French fries with ketchup or baked potatoes slathered in butter or cheese as a method of cheaply meeting the requirements that public school students be fed vegetables. Congressional Republicans argued that school lunches should not be determined by the federal government (or, in the case of some, any government). Remember though, these are schoolchildren, child-ren, not adults. Just as they rarely do in their own homes, they do not decide what they are fed at school. Just as their parents make those choices, hopefully based on what is best for them, at home, the government which operates public schools should have the ability to do the same during their lunch periods. In this sense the school acts in lieu of their parents if and when the parents do not send their child to school with an already packed lunch. Unfortunately, too many schools are limited by small budgets and large contracts with processed food vendors and too often purchase foods based on what is the cheapest or easiest to prepare. Allowing them to continue this practice by declaring a tomato sauce as a proper vegetable will only continue this practice. The school should have a say as to what children are fed and should be encouraged to do so based on what is best for the children, and not necessarily what the children or The Potato Council would like to be served. (Of course children gravitate towards French fries and pizza! We humans are hard-wired to enjoy fatty, salty foods more than vegetables, especially while we are young.) Furthermore, public schools receive funding from the federal government through various programs, including those which subsidize lunches. In that light, the government not only has an interest but a responsibility to ensure that the money being distributed is being put to good use. The government should to be able to make limitations on serving items that hardly qualify as food and certainly aren’t nutritious, especially in a time like the present when we face such inconceivable and preventable health problems wrought by the foods we eat. This demonstrates how, even when Tom Vilsack is on the side of doing the right thing for the health of our nation, Congress gets in the way due to the special interest groups which largely guide their decision making. Ask yourself this: by declaring pizza sauce a vegetable, who are they serving? It is certainly not school children in the school districts they represent. It’s the American Frozen Food Institute, the National Potato Council, ConAgra, etc. Take a look at House Committee on Agriculture Chairman, Frank Lucas. In 2011-2012 his top campaign funding came from American Crystal Sugar, Dean Foods, and Flo-Sun Inc, a company which operates sugar mills in Florida. His third highest donor in the 2009-2010 election cycle was Monsanto. It’s a shame that school children or their parents can’t afford the lobbying power to be heard in DC quite in the way that agricultural conglomorates can. One would think the rates of heart disease and diabetes, especially amongst America’s youth, would be enough to speak for themselves. 1. Preheat oven to 350 degrees. Butter a 13 x 9 inch pan. Line the pan with parchment paper and butter that as well. 2. 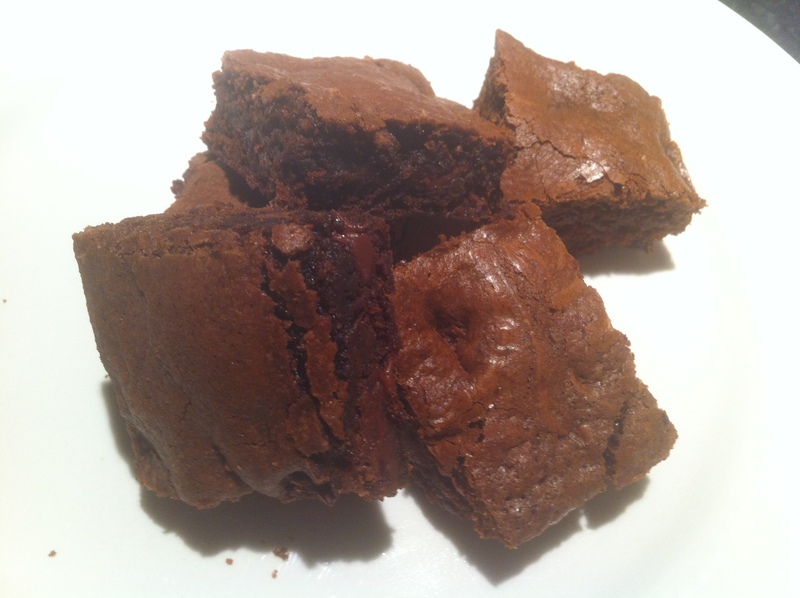 Melt chopped dark chocolate and butter over a double broiler. 3. Once melted, allow to cool slightly. After about 10 minutes, add eggs and mix well. Add sugar, vanilla, flour and baking soda. Add chocolate chips. 4. Pour half the batter into the prepared pan. Spread the Nutella over the top of the batter. Pour the remaining batter on top. 5. Bake for 20-25 minutes or until inserted toothpick comes out clean. The United States of Arugula.